“Institutional reform has been carried out aggressively, the legal system for investment and business has been improved constantly in order to establish a consistent regulatory framework and facilitate M&A market development in Vietnam. With our own capital and funds from domestic and international fund management companies, we will gradually shift to M&A activities and we will focus on State-owned enterprises (SOEs), particularly publicly listed and traded ones,” said Mr. Le Khanh Trinh, Chairman of the Board of Directors of Truong Tien Group Joint Stock Company, in an interview granted to the Vietnam Business Forum Magazine. Ahead of the Lunar New Year 2019 - Year of the Pig, could you please share the strategy as well central objectives and tasks of Truong Tien Group in 2019? We aim to build Truong Tien Group into a multi-business finance company engaged in production, business, trade, finance, nonbanking, corporate restructuring, and corporate mergers and acquisitions (M&A) with a business value of US$1 billion. The firm expects to own and operate at least 35 domestic and foreign enterprises in the next five years. In addition to running project purchase and sale, and M&As (especially in finance), Truong Tien Group develops vacation property with typical projects being Binh Tien Tourist Area; a hotel purchased at Nhat Le Beach, Quang Binh province; a hotel leased from the Vietnam Farmers Association; Moc Chau Resort and Villas - a venture between Discovery Group Joint Stock Company and Truong Tien Holdings Joint Stock Company. The group built and operated Dong Mo Tourist Area, deployed the Sky Garden Dinh Cong Project and Central Dark City Urban Area Project in Buon Ma Thuot City. We are also carrying out CH Pay e-banking project. This innovative strategic project driven by the Fourth Industrial Revolution is allowed to use worldwide. 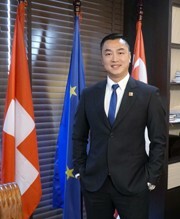 Truong Tien is applying for a license from a Swiss bank to open a Digital Bank using the CH Pay system and is expected to have the operating license in the first quarter of 2019. CH Pay is developed and applied like Samsung Pay, but it eyes international banks and investment funds as partners. Up to now, 20 domestic and international banking partners with millions of users are ready to cooperate with CH Pay of Truong Tien Group. The group boldly spends a lot revitalizing two big real estate projects - Bo De Resort & Spa and Sky Garden Dinh Cong. Would you share the group’s plan for these two projects? On May 15, 2018, Truong Tien Group signed a contract on capital contribution and arrange investment capital (up to 65%) to revive Bo De Resort & Spa Project. We are co-operating with Dong Mo Trade Investment Joint Stock Company to carry out the project. As scheduled, its construction works, such as operation building and product showroom, have been basically completed. The Sky Garden Dinh Cong Project is invested by Dinh Cong Co., Ltd. The project is located on 7,000 square meters at No. 12, Alley 115, Dinh Cong Street, Dinh Cong Ward (Hoang Mai District, Hanoi City). The project consists of 28 floors, one technical floor, one roof floor and two basements. Truong Tien Group has contributed 40% of the fund to execute the project. The project will be a beautiful residence, situated in the heart of Hanoi, just 1 km from Giap Bat Railway Station, not far from Bach Mai Hospital, Post Office Hospital, Hanoi University of Science and Technology, National Economics University and Civil Engineering University. Sky Garden features the blending of classics and modernity, a place that blends the natural beauty with the human ingenuity and elegantly blends the bustling urban life and the peaceful green space. Sky Garden promises to bring all high-class facilities to residents. Truong Tien Group will speed up construction to complete the project at the end of 2019. From the perspective of a business, what do you think about the economic picture of Vietnam in 2018? Do you have any forecasts for 2019? How should authorities of all levels support enterprises? 2018 elapsed with many positive and comprehensive results in all fields. We portrayed a bright economic picture glorified by the highest GDP growth in 10 years while inflation was lower than expected. Macroeconomic stability and the signing of new-generation free trade agreements (FTAs) reduced negative impacts from the international market. 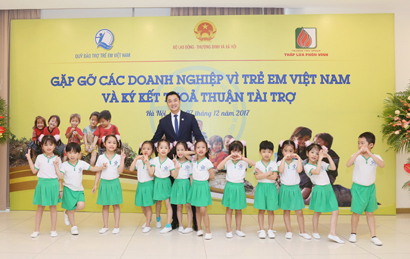 Not only endeavoring to achieve success and make its name on the Vietnamese economic landscape, in the past 10 years, Truong Tien Group has always been a red address for disadvantaged and vulnerable people. The group uses 3% of its profits for charity and social security. Its typical activities include providing medical check-ups for 500 elderly people in Soc Son district (Hanoi), delivering disaster relief to Son Ca Preschool in Ha Giang province, and presenting 500 gifts to the Hai Duong Study Encouragement Fund. Shortly before the Lunar New Year 2019 - Year of the Pig, despite being much busier than other times in the year, the management and the staff of Truong Tien Group have visited remote communes in Ha Giang and Yen Bai provinces to present gifts to poor families there to give them a happier new year holiday. The impressive economic growth in 2018 was expected to be a driving force for economic growth in 2019. However, in 2019, Vietnam's economy will be affected by mixed international economic developments. With a small economic scale, Vietnam's response to future shocks may be more difficult because of limited financial and monetary balance. In addition, these challenges came from internal economic factors such as low technological level, soil and resource shrinkage, and slow improvement of economic productivity, performance and competitiveness. The traditional drives of economic growth for many years are investment and mining industry, but they have almost no room for development. The FDI sector does not have large-scale manufacturing projects in operation in 2019 - 2020 to spur growth as in 2017 and 2018. The biggest challenge is how our resilience and adaptation, from the perspective of macro policies, eliminate difficulties and challenges but also stimulate economic potential. Central and local authorities facilitate and support enterprises to deal with hardships; further simplifying administrative procedures and improving the local business environment to save time and costs for businesses. Policymaking process needs close coordination and directness of all-tier governments and the business community. Particularly, policies must be made in line with current development requirements and conform with international integration commitments to meet legitimate aspirations of enterprises. When policies are applied to practice, authorities also need to listen to feedbacks from enterprises to make appropriate adjustments. On the occasion of the Lunar New Year 2019 - Year of the Pig, I would like to wish the Vietnam Chamber of Commerce and Industry (VCCI) and the Vietnamese business community a new year of new successes!